March 24, 2014 - Malaysia Airlines deeply regrets that we have to assume that MH370 "ended its journey" in the Southern Indian Ocean. 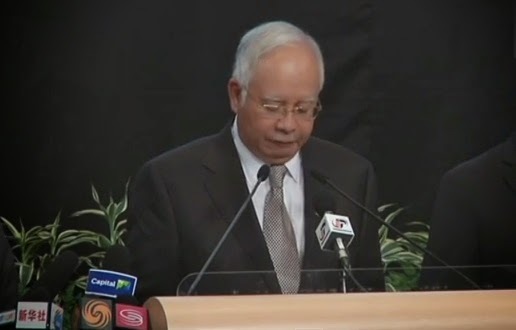 Malaysia’s Prime Minister Najib Razak announced the findings on a televised press conference on Monday with new analysis using satellite data that suggests the plane went down in the Southern Indian Ocean. The presser came after three new sightings of possible debris, with France as well announcing yesterday that its satellite sighted possible wreckage from the plane in the southern Indian Ocean. The Australian media received different version coming from a member of the search jet P-3 Orion crew, saying he saw at least 4 different objects: “The first object was rectangular, slightly below the ocean, the second object was circular, also slightly below the ocean”, “We came across a cylindrical object that was 2m long about 30cm across, and we came across another item that was also cylindrical and shaped in a rough fish hook”. The new objects were spotted in the search area about 2,500 kilometres southwest of Perth at about 2.45pm Australian time. "On behalf of all of us at Malaysia Airlines and all Malaysians, our prayers go out to all the loved ones of the 226 passengers and of our 13 friends and colleagues at this enormously painful time. ", Malaysia Airlines said. "We know there are no words that we or anyone else can say which can ease your pain. We will continue to provide assistance and support to you, as we have done since MH370 first disappeared in the early hours of 8 March, while flying from Kuala Lumpur to Beijing. ", the airline company added. "The ongoing multinational search operation is said to continue, as we need to seek answers to the questions which remain. Alongside the search for MH370, there will be an intensive investigation, which we hope will also provide answers." "Once again, we humbly offer our sincere thoughts, prayers and condolences to everyone affected by this tragedy."